This blog is named after two of my Ancestors whom have featured significantly in my determination/ obsession to “find family”. The first of these is my Irish 2x Great Grandmother, Susan Kelleher, whom I’ve written about often. 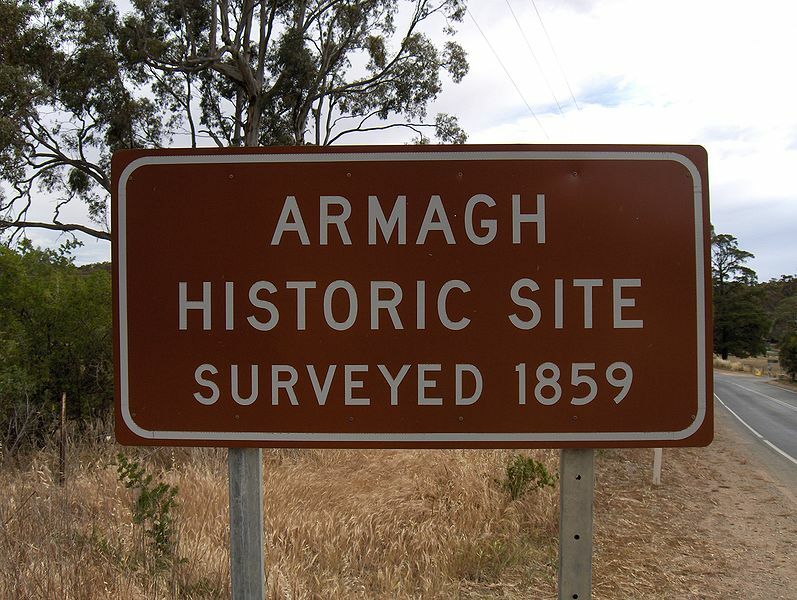 After fleeing the horrors of the “Irish Potato Famine“, becoming shipwrecked, marrying and widowed young with 3 small children, marrying again… Susan’s final move, in 1887, was from Laura in the Mid North of South Australia to Broken Hill, in the far north west of New South Wales . This was at the beginning of the mining boom when silver was discovered in huge quantities, the creation of BHP etc. Many of Susan’s children moved to Broken Hill with her. My Grandmother, Elizabeth Mary Murray, daughter of Eliza Jane (Rowen) Murray and Peter was born there and survived the horrific living condition which her two younger baby brothers did not. First thing I will be doing is trying to find Susan’s home in Sulphide Street on “Google Maps“ and how wonderful it would be if it’s not been re-developed… but no worries. Just being on the street where my Susan lived will be enough for me. I love modern technology and I especially love TROVE. Many thanks to Amy Houston, of Branches, Leaves & Pollen, for initiating the TROVE TUESDAY Theme. Please click HERE to visit Amy’s Blog and HERE to read the contributions of others. 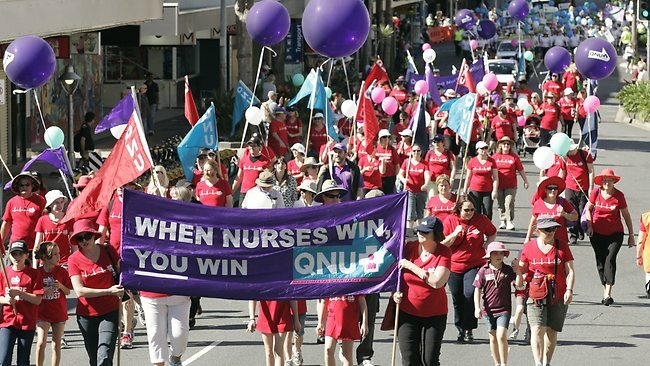 We South Australians have just enjoyed a “Long Weekend” to celebrate “Labour Day” and many marched in the streets in remembrance. Mum always determinedly referred to it at “8 hours day” and reminded her children how hard the Unions toiled, with the workers, for better working conditions. In the early 19th century, most labourers worked 10- or 12-hour days for six days each week. 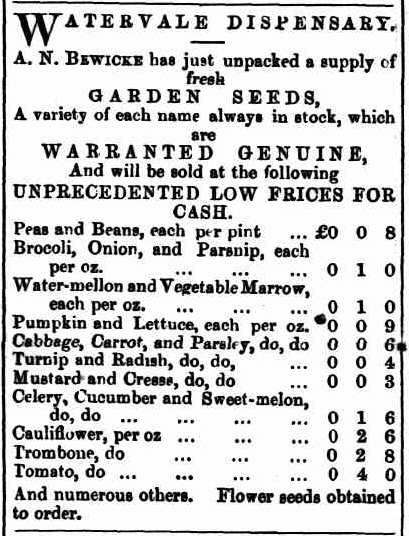 The 1850s brought a strong push for better conditions. The fight was for an eight-hour day, effectively a 48-hour week to replace the 60-hour week and Australian workers stopped work and marched from the University of Melbourne to Parliament House. The government finally agreed to an eight-hour day for workers employed on public works, with no loss of pay. This win was a world first but did not end all labour problems. 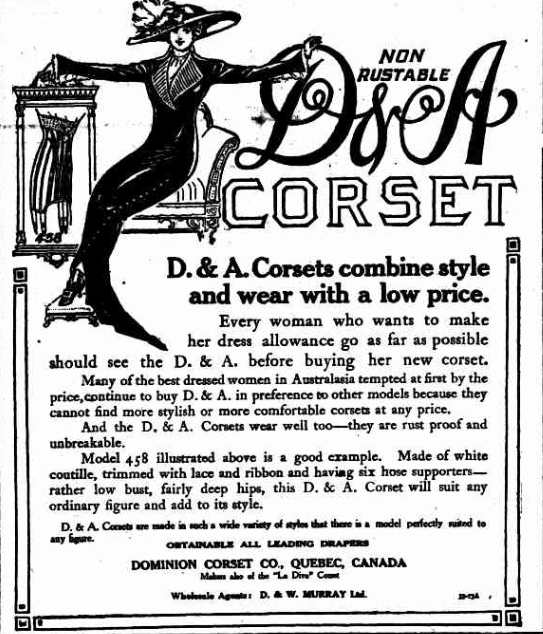 Many working conditions were harsh and demanding, and women were paid a lot less than men. 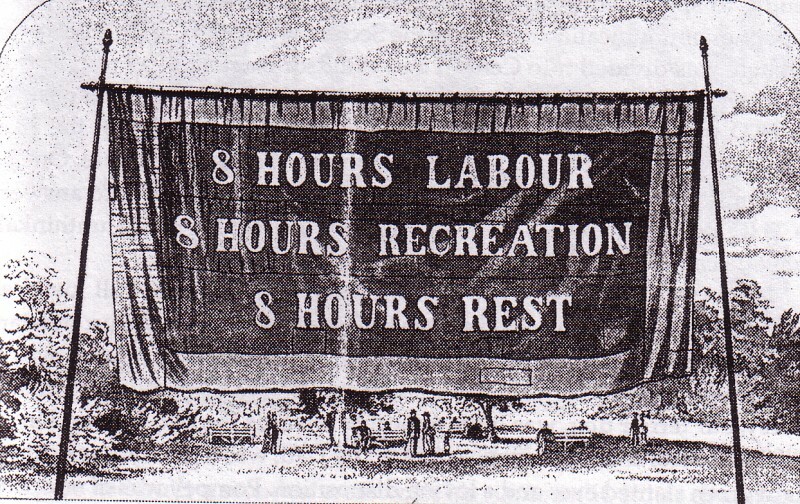 However, the victory for the eight-hour day was a significant breakthrough, by the Unions to improve working conditions in Australia. As our three day weekend came to a close mum’s words came flooding back so I checked Trove to see what I could find on our National Library of Australia site and to my delight was advised of a photo held here in our State Library of South Australia. 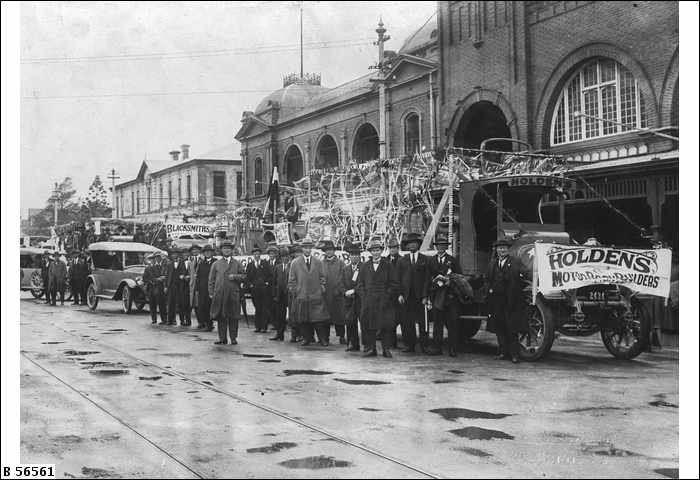 It shows Holden’s float for the 8 Hour Day procession in 1925 with a group of men standing alongside. The lorry was an A.E.C. registration number 24-347 and was new in 1925. This is the year my mum was born and her dad, Frederick Alexander ALLAN, would have been marching in that parade with others in the Waterside Workers Federation. Many thanks also to Amy Houston, of Branches, Leaves & Pollen, for initiating the TROVE TUESDAY Theme. Please click HERE to visit Amy’s Blog and HERE to read the contributions of others. TROVE TUESDAY: Show time in Adelaide!!! 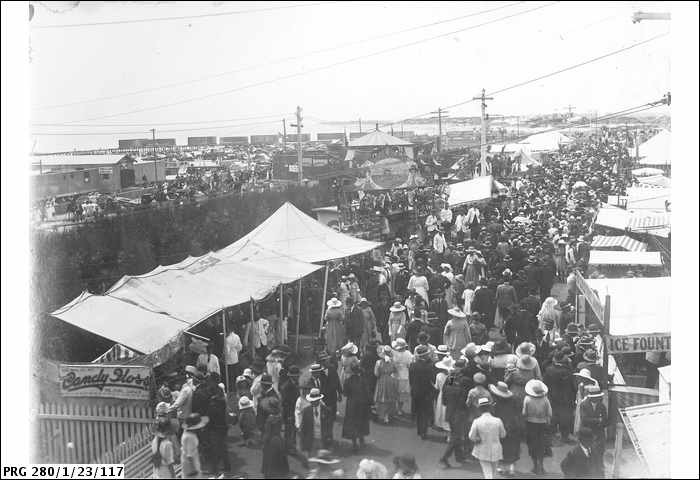 It’s SHOW TIME here in South Australia, with lots of fun, spills and laughter as the 2013 Royal Adelaide Show kicks on… What a surprise it was to discover, thanks to TERRIFIC TROVE, that it was also ShowTime, here in Adelaide, exactly 100 years ago. Hope you enjoy my discoveries as much as I did. 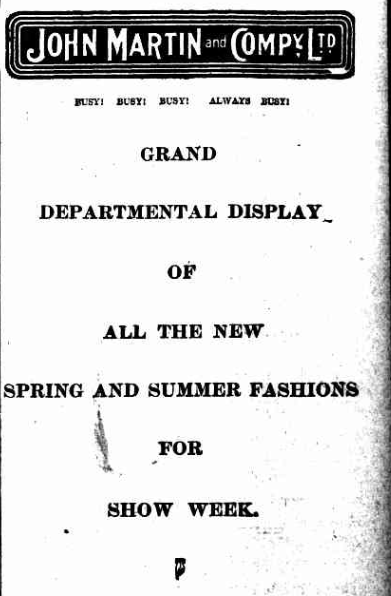 On the very first page it’s clear that, in 1913, the “Royal Adelaide Show” was the perfect opportunity for retailers to seek the patronage of the many country folk flocking to the City. 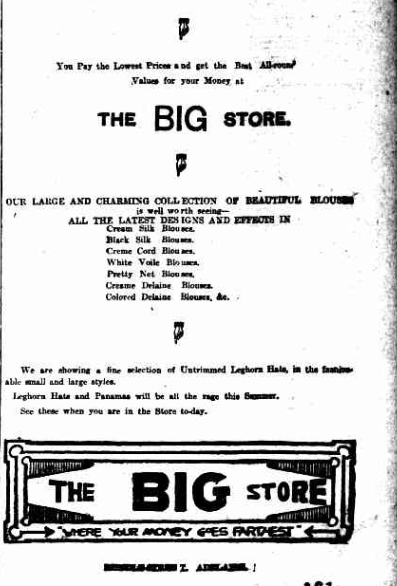 John Martin’s, the iconic Adelaide department store affectionately known as “Johnnies”, paved the way with this full column advertisement on Page 1. Page 2 offers a raft of Amusements to take in, interesting “Funerals” also get a mention under the Amusements. 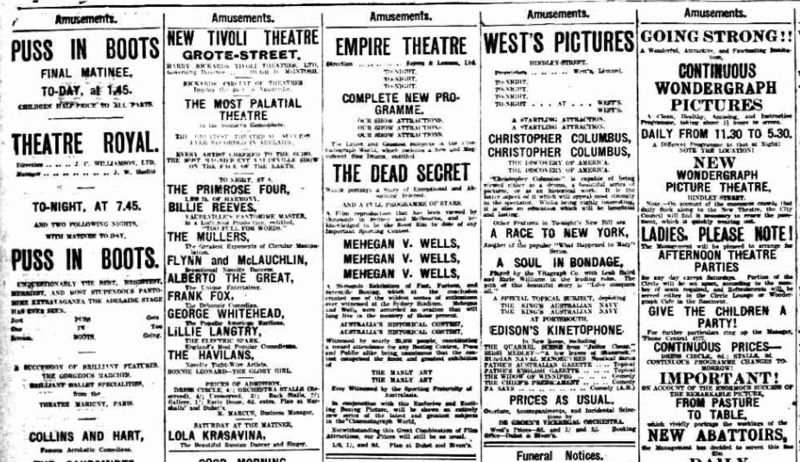 On that same page we see advertised some of the events Show. Whilst all this “show time” activity was going on, I was most pleased to see that our “pollies” were hard at work in the South Australian Parliament… and noted that there was one of those familiar “land grabs” to take some of Colonel William Light‘s planned” parklands” for other purposes. 100 years later, I can say that “the powers that be” were successful in eating away at our “lungs of the city” and the “Police Barracks” were indeed built there. 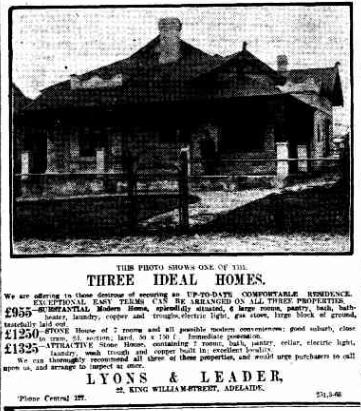 On page 9 we see three “ideal homes” advertised for sale and the next three pages are chocka full of all the other opportunities “our country cousins” have to purchase homes in suburbia. 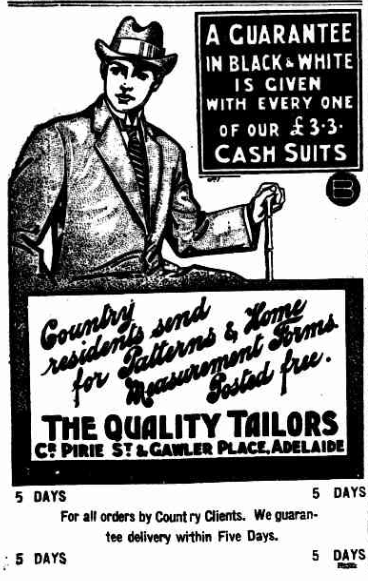 and popping into the “Quality Tailors” for a guaranteed 3 Guinea (3 pounds and three shillings, in the old currency) suit might be well worth checking out. 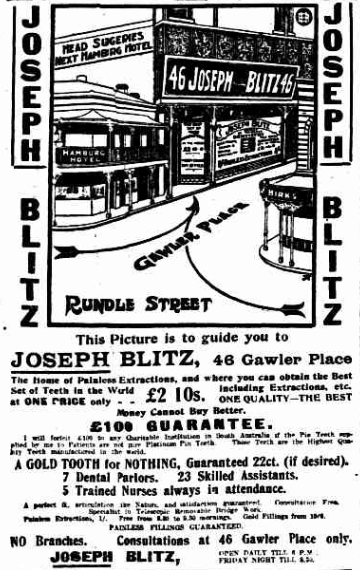 Whilst I’m in that area maybe a trip to get my teeth checked would be the way to go… Maybe I’ll get them all pulled out and be done with it?… Joseph Blitz says, on page 19, that he can provide me with “the best set of teeth in the world“. mmmhhh… ? Oh look!!! … I missed that back there on Page 23. 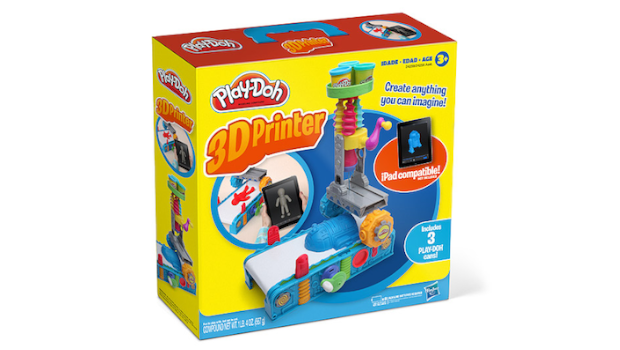 Must get some photos of the kiddies. Not sure if I’ll have time to make it to the dentist this year. Thanks TROVE… I love you. Many thanks also to Amy Houston, of Branches, Leaves & Pollen, for initiating the TROVE TUESDAY Theme. Please click HERE to visit Amy’s Blog and HERE to read the contributions of others. 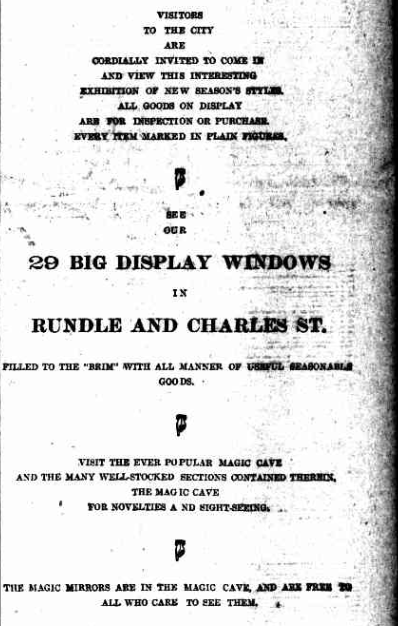 Incidentally, apart from the Amusements page and the Advertiser Banner… all pictures are exactly the same size, as published, in The Advertiser of 10 September 1913. 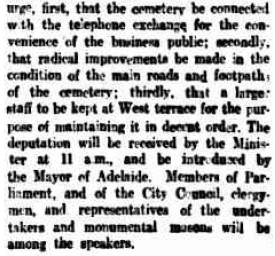 It is clear that managing South Australian cemeteries has always been problematic and continues today. 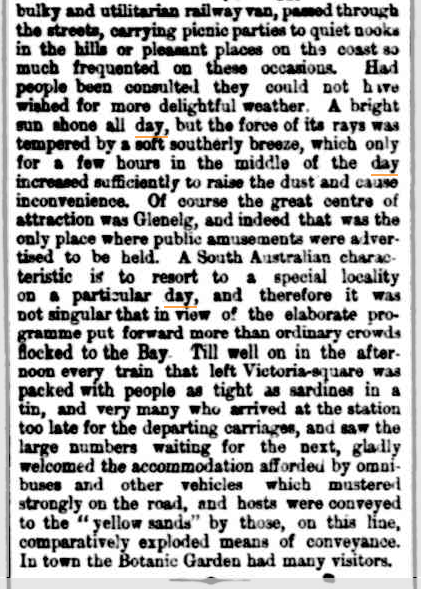 Trove, which is indeed a Treasure Trove of unfathomable beauty, dropped this little jewel into my cyber-space orbit today, from the “South Australian Register” circa 1904. Thankyou TROVE for providing invaluable information to help us re-construct the past and put our Ancestor’s lives into perspective. I love you!!! 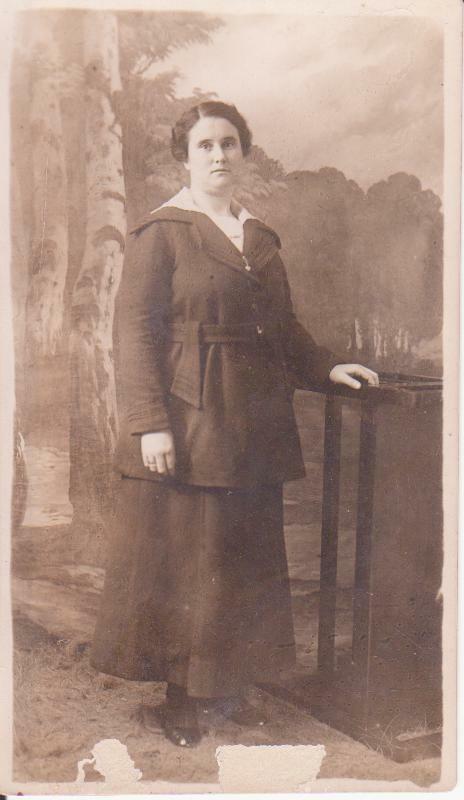 My Nana, Elizabeth Mary (Murray/ Evans) Allan was born in Broken Hill, New South Wales, Australia, on 19 Sep 1892. 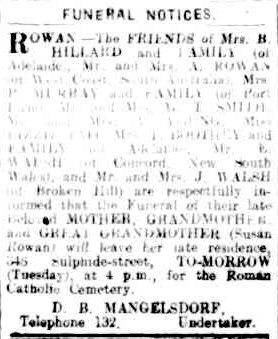 Nana was the third child of Eliza Jane Rowen, and Peter Murray, and the first to survive the terrible living conditions in Broken Hill at that time…so, as the 121st Anniversary of her birth is fast approaching I decided to check with TROVE to have a look at the reported events on the actual day she was born. Through the wonders of TROVE I’d already discovered that there was huge Industrial unrest, and a miner’s strike, in which my Nana’s Uncle Andrew was involved a month after her birth. You can read about this in my “Scabs and Riots” post by clicking here. The Barrier Miner, on the day Nana was born, reported that the Miner’s Strike in Broken Hill was being supported as far away as Sydney with some 10,000 people protesting and demonstrating. 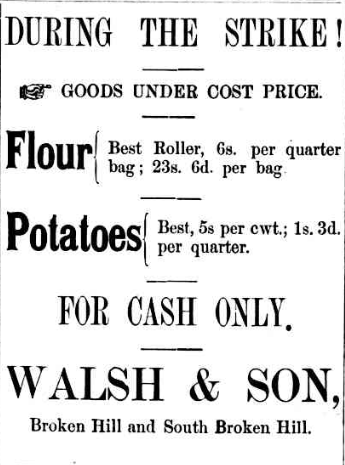 Advertisements, on that some day, show how some retailers were supporting the striking workers in helping them feed their families. Thankyou TROVE for providing the information to help me re- construct the lives of my Ancestors, confirming some family stories whilst dispelling some of the myths. It’s now 158 years since by Great Great Grandmother, Susan Kelleher, arrived in South Australia from Ireland, aboard the ill-fated Nashwauk and I was wondering what life was like for Susan, after her arrival? Did she often reflect back to the night of the wreck? Did she remember the Anniversary of that traumatic event as she made a life for herself in this foreign land?… Of course, we can never know the answers to these questions but I decided to use TROVE, and look through our digitised Australian newspapers, to get a sense of what was happening in the area where Susan made her home on the 15th Anniversary of the Wreck of the Nashwauk… 13 May 1870. On her arrival in South Australia, Susan was initially housed in the German Hospital, Carrington Street, Adelaide and transported 4 months later to the newly established “Clare Servants Depot”, in the mid north of South Australia, from which she was employed by Mr Bryden, near Skillogalee Creek, at 5/- a week. Four months later, on 17 Jan 1866, Susan married Edward Nicholls and they had three daughters, Catherine Ann, Mary Anne and Margaret Nicholls. 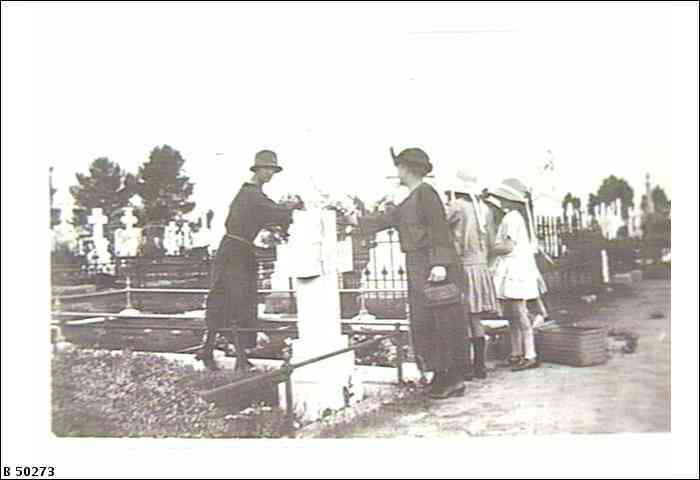 On 20 Oct 1860, when Margaret was only 2 1/2 months old, Edward died of Bronchitis and was buried at his workplace, Bungaree Station. The following year Susan, who was working as a Dressmaker, purchased land at Armagh (just outside of the township of Clare) and settled in a home there with her 3 daughters. On 7 Feb 1864, after almost 3 1/2 years as a Widow, Susan married a near neighbour Timothy Rowen. By the time of the 15th Anniversary of her arrival, and the shipwreck, Susan had added to her family with 3 more children: Bridget, Eliza Jane (my great grandmother) and her only son Andrew Rowen. She did go on to have another 2 children, Susan and Mary Ellen, but on 13 May 1870 Susan had been widowed, remarried, given birth to only 6 children of her 8 children and still lived at Armagh on the outskirts of the township of Clare with her husband and children. 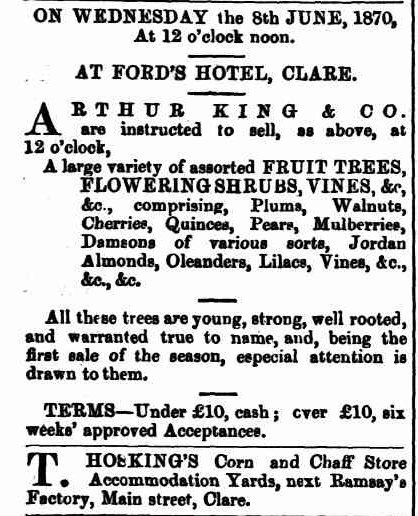 Their local paper was the Northern Argus and this is what I found on Pages 1 and 2 which I expect would have been of interest to Susan and her husband, Timothy Rowen, as they worked and provided for their 6 children. 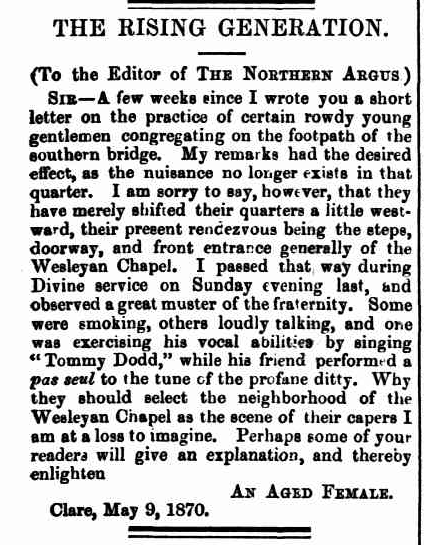 On page 3 I found this letter which shows that even 143 years ago the young were irritating their elders with “rowdy” behaviour. So thanks to TROVE I have a snapshot of what daily life was like for Susan on the 15th Anniversary of her arrival and wonder if, in her busy life, she took a moment to reflect on her unusual landing in this new, and foreign, country. 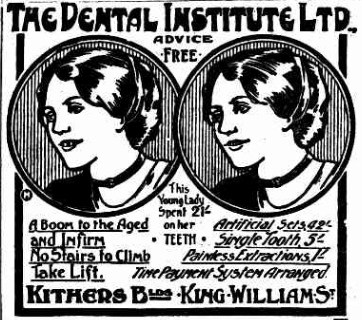 Our Australian Digitised newspapers, provided free of charge by the National Library of Australia, are not only interesting and entertaining but provide a wealth of information for those researching family. 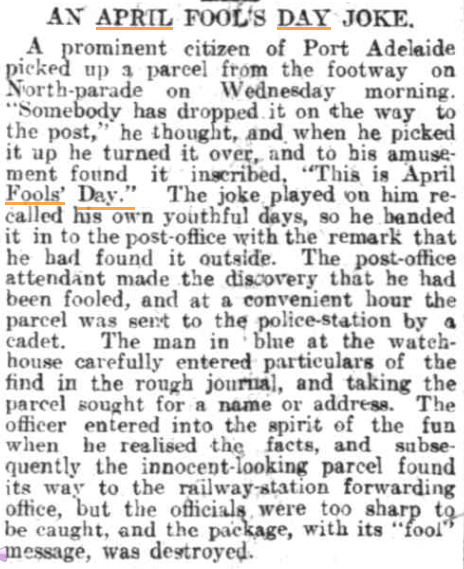 This article from the 1927 Adelaide newspaper, “The Mail” is but one example of the value of this wonderful resource. Saturday 27 August 1927page 1. 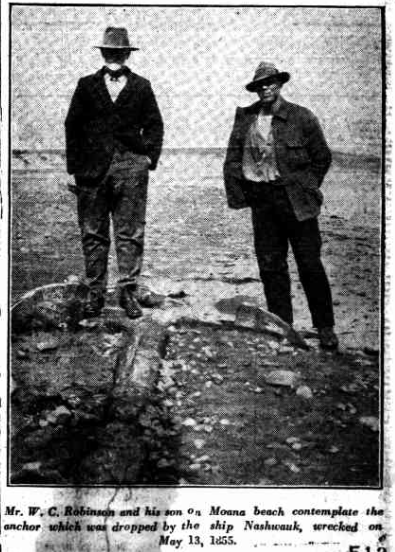 Finally the mystery of “the Anchor”, which had been embedded in sand on a southern South Australian beach for 73 years, was solved. It was indeed the abandoned anchor from the ill fated ship “The Nashwauk”, the Irish “bride ship” on which my 18 year old Great Great Grand-mother Susan Kelleher, and her sister Bridget, emigrated and was wrecked just 40 miles short of their destination. 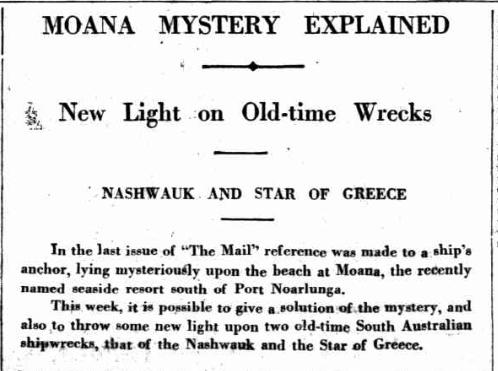 A witness, Mr Giles, confirmed the anchor was not that of the other nearby shipwreck, “The Star of Greece“. 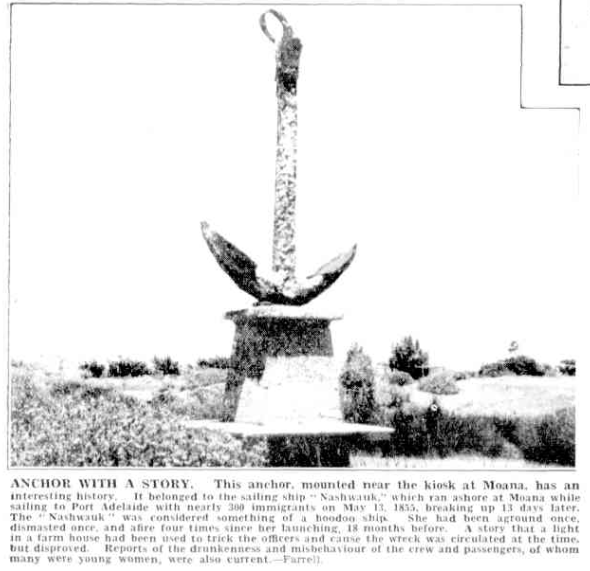 For 73 years the Nashwauk Anchor lay abandoned near the shoreline until in 1927, the same years that the Roundhouse was constructed, the Noarlunga Council offered a reward for its recovery. Local residents, Mr Robinson, his brother, son and three of their horses successfully completed the task. 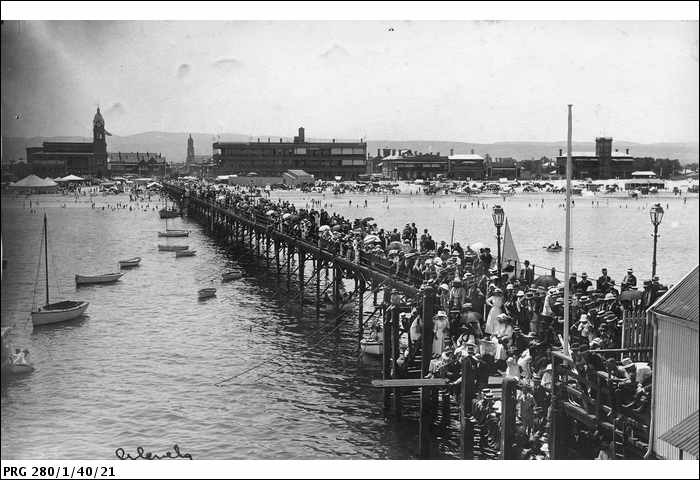 As the area developed the iconic Roundhouse was demolished the Anchor moved, from its grand plinth on the foreshore, and embedded in a slab of concrete in the Moana Caravan Park. Although no longer the grand monument to Irish Immigration, and the settlement of South Australia, but rusting away behind boom gates. However, at least it survived and for that we’re very grateful. 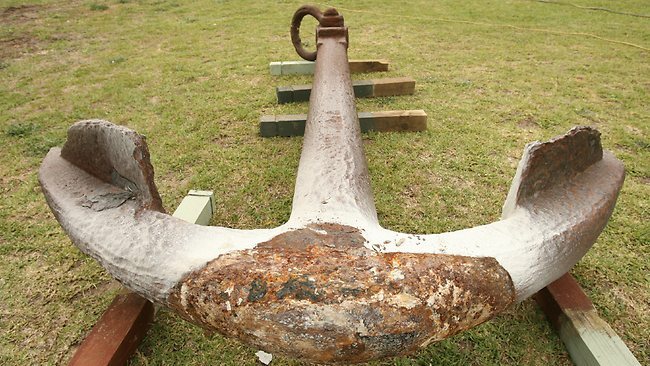 In 2010 the curator of the Exhibition – “Not Just Ned – A True History of Irish Settlement in Australia” Dr Reid, borrowed the “Nashwauk Anchor” had it restored by the Australian National Museum and placed this iconic relic on display in Canberra. 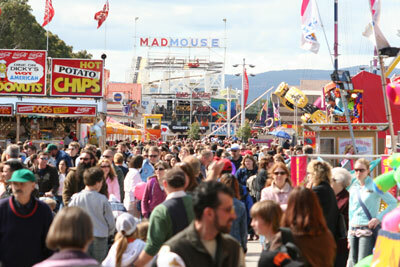 It’s now back in South Australia, the public is being consulted re: its placement. Many are calling for it to go back to its original spot, in the caravan park, totally unaware its unique history. 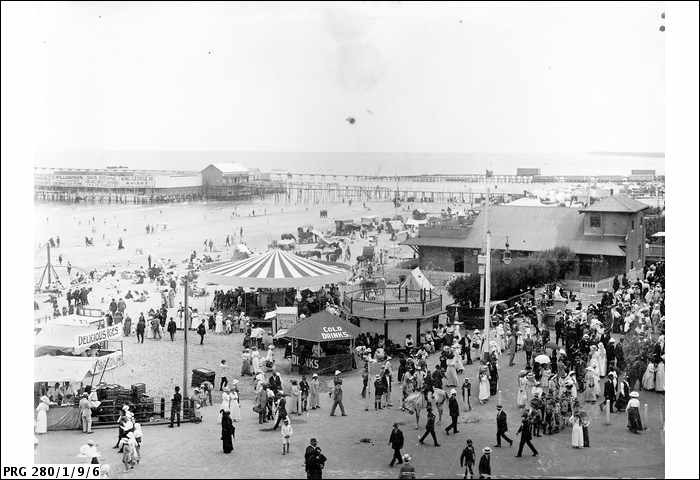 The original display site of the “Nashwauk Anchor” was never the Moana Caravan Park but on the foreshore, alongside the iconic Roundhouse which unfortunately was demolished in 2006. This article, in the 1927 copy of “The Mail”, is but one of the many which describe these events, can be accessed on-line and are there to “set the record straight” so the decision makers have the correct facts upon which to base their decision. Public consultation of the placement of the restored Anchor is just that… “public“. You do not need to live in the area to provide feedback and if you are of Irish descent and especially if your Ancestors were immigrants on the “Nashwauk” you are an “interested person” and entitled to contribute your opinion. Only problem is, if you wish to give feedback, that there is a very tight time-line and responses need to be in by this Friday, 3 May 2013… however, with the wonders of modern technology you can quickly and easily contribute. 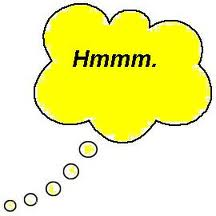 Just click HERE to access my post where you’ll find the link to provide on-line feedback. I’ve never been much of a prankster except for a few times I stuck a sign on one of my brother’s back reading “kick me”. Not real original. Now my mum just loved April Fool’s Day which I wrote about briefly HERE. This year I’ve been musing over where mum got her sense of humour and whether, in days gone by, our ancestors also played jokes on April Fool’s Day. 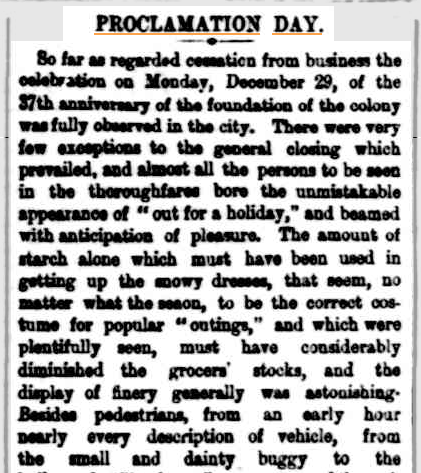 With it being Trove Tuesday… to the old newspapers I headed. I remember mum saying that her mum, my Nana (Elizabeth Mary Murray Evans Allan) was not just a feisty woman but also quite a jokester, so I decided to check out the Port Pirie newspapers which is where she would have been living at that time, with her first husband and two of her three children. 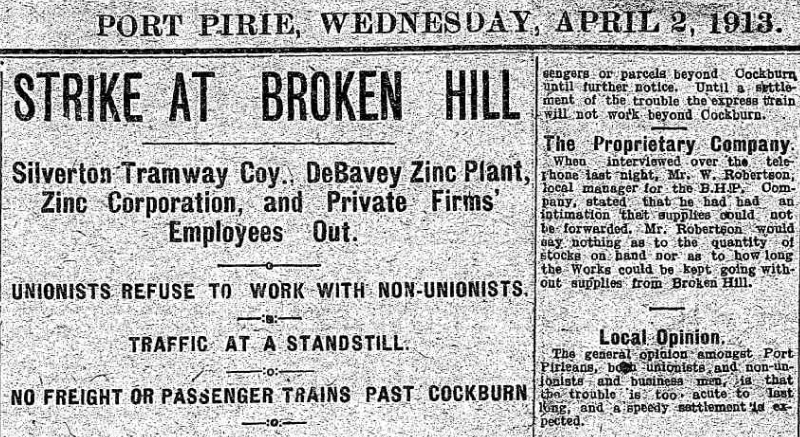 There was no joy to be had there as the Port Pirie Recorder was full of doom and gloom, not the least of which was the huge miner’s strike taking place in Broken Hill and affecting many workers, and industries including those in nearby Port Pirie. There was no sense in checking out newspapers in other locations, for most of my maternal ancestors lived in surrounding districts and would have been similarly affected by the miner’s strike. 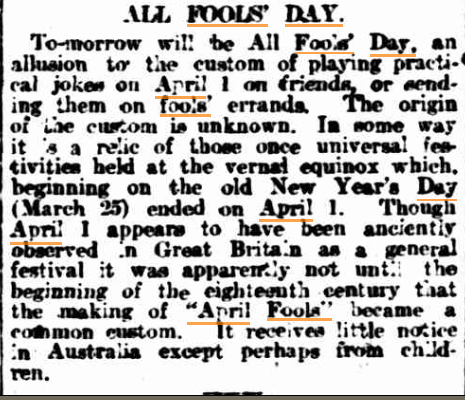 So a general search for April Fool’s Day 1913 was my next port of call and these items in the Adelaide Advertiser, although not published in 1913, drew my attention. AN APRIL FOOL’S DAY JOKE. 2 Apr 1914. p8. 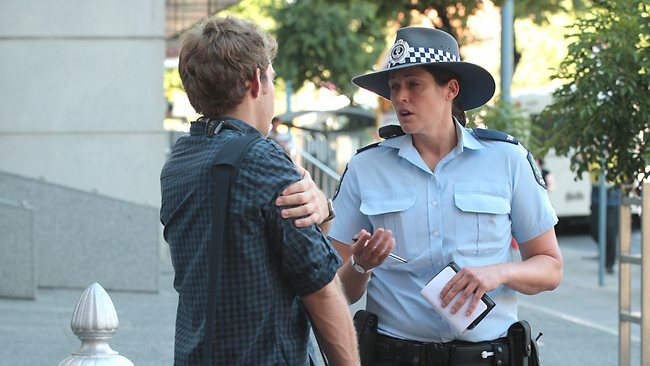 The Advertiser: Adelaide, South Australia. 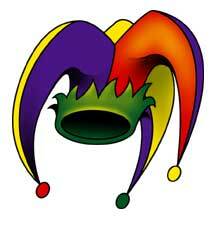 ALL FOOLS’ DAY. 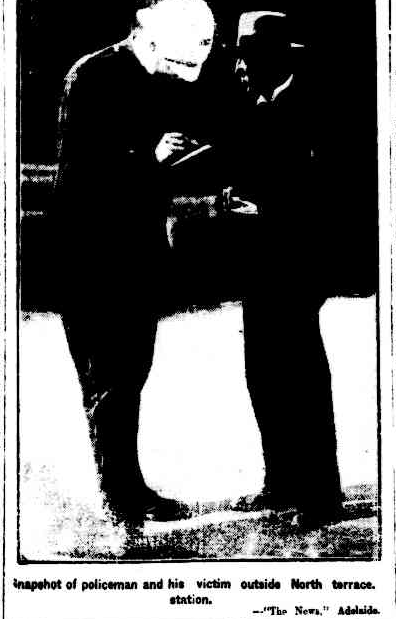 31 Mar 1919. pg.6. 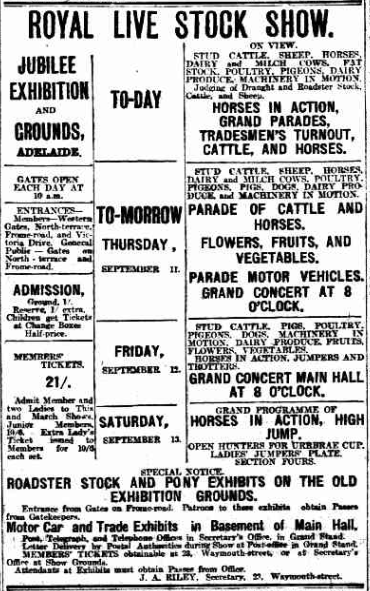 The Advertiser: Adelaide, South Australia. Many thanks to Amy Houston for setting up the Trove Tuesday meme and also to TROVE… where would we be without you? 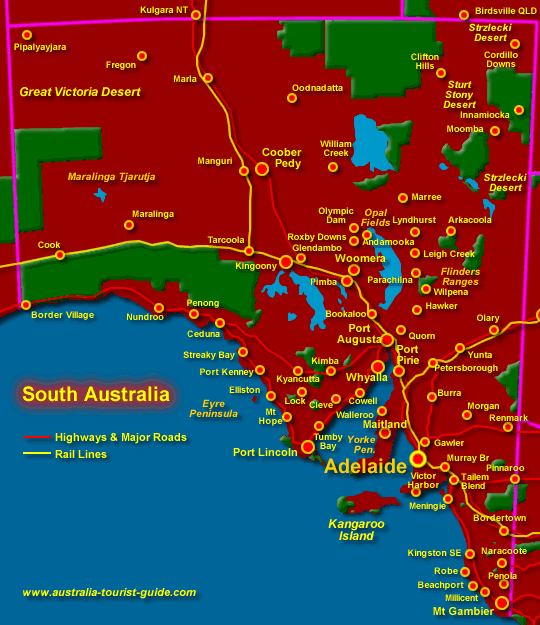 Here we are… Port Pirie is north of the capital city, Adelaide (just above the “leg”) and Broken Hill is in NSW, just over the north east corner of South Australia .